By Sister Maryann Seton Lopiccolo, S.C.
Sisters Servants of the Lord and the Virgin of Matará in Brooklyn. Photo courtesy of Sister Maryann Lopiccolo, S.C. Since 2008, the feast of the Presentation of Mary, Nov. 21, has been dedicated to highlight the cloistered and monastic life in the worldwide Church. Taking this invitation to heart, the Diocese of Brooklyn will celebrate a day to pray for and support all of its contemplative and cloistered religious on Saturday, Nov. 17. All are welcome to join in a Holy Hour, Vespers and Benediction, starting at 4 p.m. at the Monastery of the Precious Blood and St. Edith Stein, Borough Park. These monasteries and contemplative Houses of Prayer have been sources of grace and blessings to the diocese for many years. Memories and stories abound among Brooklynites who remember asking these sisters to pray for special intentions, receiving Mass cards and prayer cards for special occasions and bringing donations of food and other goods when the chapel bells rang out for assistance. 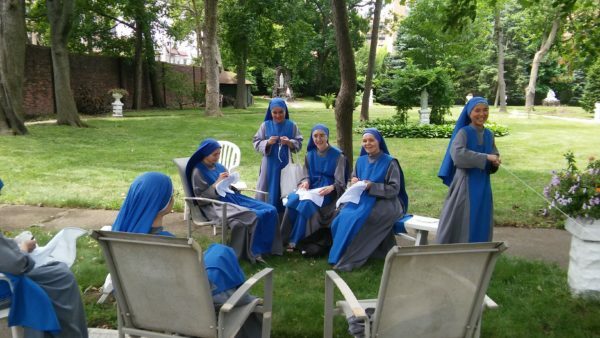 The faces have changed and some structures relaxed a bit, but the presence of these nuns who are committed to lives of prayer and solitude continue to nourish and grace the diocese. They remind all of us that we are about doing God’s work in the “vineyard” and without a store-house of prayer behind us, our efforts may fall short of God’s desires for the Church and world. Remember in prayer these women who live their lives of commitment and prayer as the diocese commemorates their day, Nov. 17. Be assured that they continue to hold the diocese in their prayers each day. Mondays, Thursdays, First Fridays: Adoration of the Blessed Sacrament after Mass until 12:30 p.m., 3:30-6 p.m.
Daily: Chapel is open, 7 a.m. to 6 p.m., to visit the Blessed Sacrament; Monday-Saturday: Mass at 7:30 a.m.; Sunday: Mass at 8:30 a.m.
Third Sunday of each month: Exposition of the Blessed Sacrament at 3 p.m. and Devotions to the Holy Face of Jesus at 4 p.m., followed by Benediction. Masses: Monday-Friday, 7:15 a.m.; Saturday, 8 a.m.; Sunday, 9 a.m.
Sundays: Adoration with Rosary and Evening Prayer, 4-5:50 p.m. Annual Sacred Heart Novena (June): Nine days before feast: 7:30 p.m.
Eucharistic Adoration and Prayer: Mondays, Tuesdays, Thursdays: 10 a.m.-1 p.m. and 3-6:30 p.m.; Fridays: 10 a.m.-7 p.m.; Wednesdays and Sundays: 5-7 p.m.